This all-in-one boxed package is composed of new editions of the flagship game in the series -Saratoga, the long-out-of-print Brandywine, and Guilford/Eutaw Springs. Below is more detail on exactly what you’ll find in the package. As you’ll note, there are considerable additions and changes from the original games, as designer Mark Miklos has endeavored to create and update the finest version of these games that we’ve produced to date. Plus, the package includes double-sided mounted maps for all four battles! Includes all the replacement counters that have been provided over the years, plus new Momentum counters and “Rally on Me” (see description under “Brandywine,” below) counters for the series. This battle includes a new historical scenario featuring the fighting around Freeman’s Farm. An updated countersheet includes all the counters updated over the years, plus a new marker to the series, “Rally on Me!” As you know, one of the combat results is Disruption. When this occurs, a Disruption Marker is placed on top of the Disrupted unit. If the Disrupted unit is alone in a hex or if it stacks with other units that are also Disrupted, there is no issue because the Disruption Marker remains on top of the stack, in plain sight signifying that every unit under it is Disrupted. It serves as reminder to the player to roll for Rally in the Rally Phase. When, however, Disrupted units stack with Parade Order units, those Parade Order units are placed above the Disruption Marker. This typically obscures the Disruption Marker within the stack. Particularly in larger games with high counter density and multiple fronts, where lots of action is occurring, players often forget to make their Rally rolls because they can’t readily see the Disruption Markers. The “Rally on Me!” Marker is primarily intended to be placed on top of any stack that contains a combination of Disrupted and Parade Order units in the same hex. This will be a visual cue for the player to remember his Rally die roll. 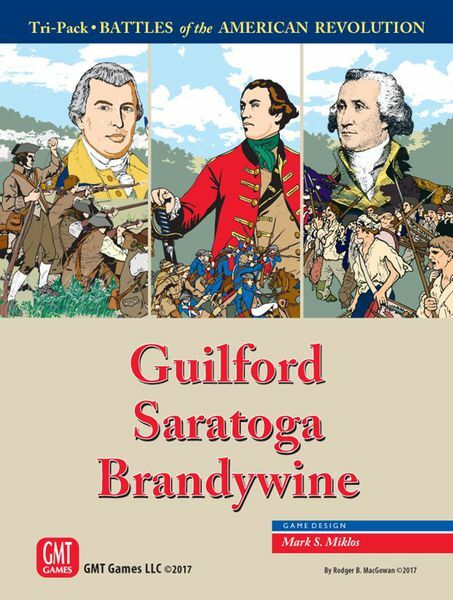 Includes an updated Brandywine mounted map with redone Charlie Kibler artwork. Updated unit deployment protocol for the Knyphausen’s Feint scenario in the Exclusive Rule Book. Also in the Exclusive Rules, new optional intelligence rules called, “Muddying the Waters of Brandywine Creek” are introduced. While the original game attempts to model the lack of good intelligence that plagued Washington by restricting American movement within the American Army Bivouac Area until a certain point in the game, this and the other devices used like optional British Brigade entry zones have become “set-piece” after all these years. Players familiar with this game can “game” those intel rules enough to mitigate their impact and as a result, the flow of action across the board is becoming a little too predictable. The new “Muddy” rules introduce a random element into both players’ decision making. There are four possible permutations: 1) neither do a recon, 2) both do a recon, 3) only the Brits do a recon, and 4) only the Americans do a recon. This is further complicated by five different possible states of the upper ford on the Brandywine (off-map): 1) Blocked, 2) Partially Blocked, 3) Hindered, 4) Open and 5) Dry. The interplay of these factors will influence how each side can maneuver so that it can never become predictable. Replacement counters for each game.